Gorgeous A-frame cabin situated on a ¼ acre lot with 79 ft of Snoqualmie River frontage. 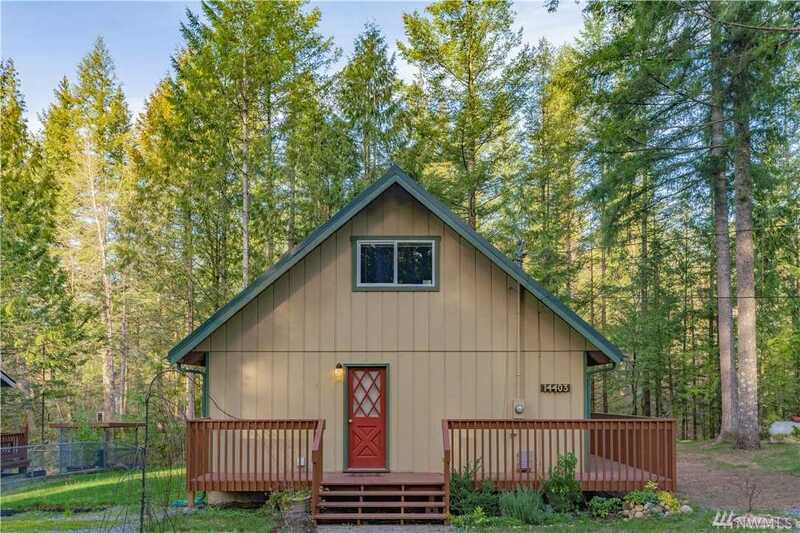 Steps away from hiking trails, but also minutes from I-90. Open concept floorplan w/vaulted ceilings and lots of natural sunlight. Upper level master suite w/river views & generous-sized main floor bedroom. French drs lead to the wraparound deck – perfect for summer BBQ’s & peaceful nights listening to the river. New wood stove provides plenty of heat and romantic ambience. Covered carport and storage shed. Lot Size: 0.26 Acres / 11320 Sq. Ft. Directions:South on 436th to Riverbend entrance on Left. Follow main road to 447th Ave SE and turn Left to 145th and turn Right to 448th and turn Left to home. SchoolsClick map icons below to view information for schools near 14403 448th Ave SE North Bend, WA 98045. North Bend Real Estate at 14403 448th Ave Se North Bend, WA 98045. Description: The real estate listing at 14403 448th Ave Se North Bend, WA 98045 with the MLS# 1406037 has been on the North Bend market for 77 days. This property located in the Riverbend subdivision is currently listed for $480,000. You are currently viewing the property details of the NWMLS listing at 14403 448th Ave Se North Bend, WA 98045, which features 2 bedrooms and 1 bathrooms, and has approximately 1270 sq.ft. of living area.